This volume provides an up-to-date coverage of the theory and applications of ordered random variables and their functions. Furthermore, it develops the distribution theory of OS systematically. Applications include procedures for the treatment of outliers and other data analysis techniques. Even when chapter and section headings are the same as in OSII, there are appreciable changes, mostly additions, with some obvious deletions. Parts of old Ch. 7, for example, are prime candidates for omission. Appendices are designed to help collate tables, computer algorithms, and software, as well as to compile related monographs on the subject matter. Extensive exercise sets will continue, many of them replaced by newer ones. H. A. DAVID, PhD, is a Distinguished Professor Emeritus in the Department of Statistics at Iowa State University. 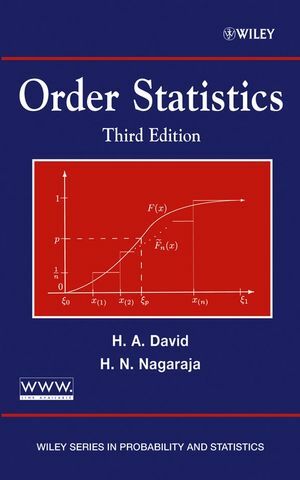 He has authored over 100 publications, including the Second Edition of Order Statistics. H. N. NAGARAJA, PhD, is a professor in the Departments of Statistics and Internal Medicine at The Ohio State University. He coedited, along with P. K. Sen and D. F. Morrison, Statistical Theory and Applications: Papers in Honor of H. A. David, and coauthored, along with B. C. Arnold and N. Balakrishnan, Records.